For their final projects, our graduating MA Culture, Criticism and Curation (MA CCC) students present a publication and a series of exhibitions and events. Working in partnership with international and national organisations, artists, designers and writers, these projects consider activism and representability, identity and the self, gender and work, community and experience. 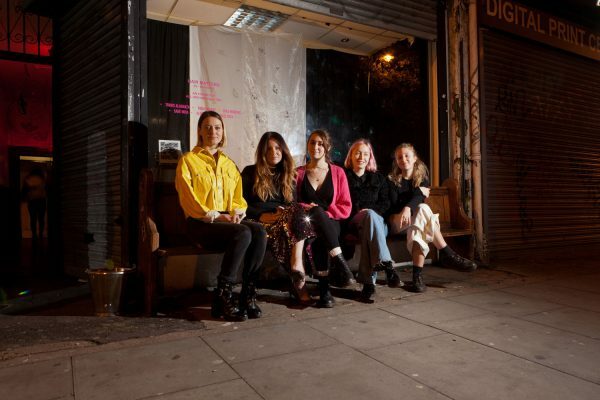 Curated by a team of six students, the Hair Matters exhibition took place in various locations around Dalston between 9–20 November. It examined the social and cultural symbolism of hair in the 21st century. From the ballroom drag scene in New York City, to the anarchic rebellion against heteronormativity, hair has always been a significant placeholder for the relation of the queer body and space. Featuring the work of six artists, the public interventions included photo manipulations, work with textiles, collage material, graphic design, ephemera and audio material. Here we talk to Bea Redweik, one of the co-curators about the project, collaboration and her plans post-graduation. Can you talk us through the project Hair Matters and its relationship to your course at Central Saint Martins? We developed the Hair Matters exhibition in collaboration with legendary queer arts and music venue vFd (formerly Vogue Fabrics.) It operated through the form of public art interventions and featured the works of six, young queer artists who explore the social and cultural symbolism of hair in the 21st century. 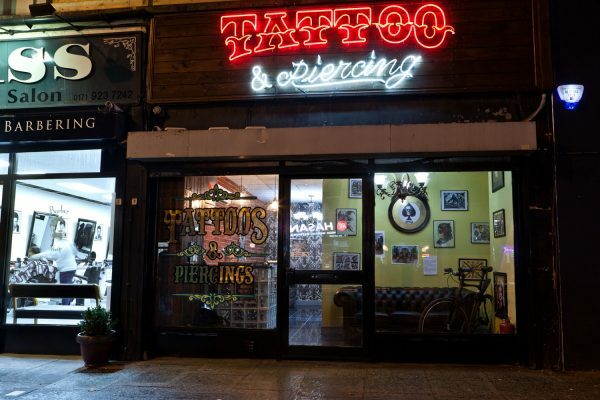 The artwork was displayed at five different locations around Dalston, including vFd’s own Outsiders Gallery, the Rio Cinema, a launderette and a tattoo shop. For us, it was important to maintain a sense of the unexpected when matching the work with the locations – as well as honouring vFd’s close ties with the local community. With regards to the exhibition’s relationship to our course, working on live, external projects is an integral part of MA CCC. Other groups on the course, for instance, worked with the Institute of Psychoanalysis or the South London Gallery. The partnership with vFd is a new one for the course – a connection for which we can thank our tutor Nathalie Khan. Moreover, I think I can speak for the whole team in saying that it has been wonderful building a relationship with vFd over the past six months and we have learnt so much from such an iconic and politically relevant organisation. What is the significance of hair in your project – why did you decide to focus on this? The theme was born out of our initial field research when vFd invited us to join them for their first Femmetopia Festival in May this year. Our understanding and feeling of the venue, of the meaning placed on body and space, eventually led to the development of this idea. We were interested in how vFd’s basement utopia manages to accommodate for such a freeing sense of movement: body as celebration, body as ownership, body as witness and body as bearer. To narrow it down, we chose to stay with the theme of the body but focus on hair. From a curatorial perspective, hair has the dual capacity to access controversy but also speak to a general audience, Hair is a very accessible topic but also one that carries a multitude of complexities. It is accessible since we all do something to our hair: cut it, colour it, dye it, style it, remove it, curl it…the list goes on. Yet, complexities remain at play: hair is a signifier of identity and by employing a queer lens, we were able to explore it as an incredibly powerful placeholder for the relations between queer body and space, beyond binary systems. How did you select the artists and works for the show? We started with numbers. Given the exhibition’s theme and its connection to identity politics we wanted to make sure to include multiple perspectives. Secondly, we kept our budget in mind; it was important to us to be able to pay the artists involved, so more than five or six artists would not have been feasible. From there, the process was organic – a back and forth of meetings, discussions, emails and research. We took into account our experiences with vFd’s Femmetopia Festival and their numerous pre-existing partnerships with incredible artists, our own personal networks and artists we admire. The overlaps of these areas resulted in our artist roster. I could not be more excited and thankful to have worked such amazing people on this project. Some of the works were specifically commissioned for Hair Matters, others were not – the brief simply asked for a response to the theme. The ‘selection’ from the curators’ came more out of trust in the artist’s vision, which we then set out to realise in the allocated spaces in Dalston – to find homes, so to speak, and build a narrative around it. Tell us about the format of the project – why was it important for you to take it out into the streets and multiple spaces, outside of the gallery? I think multiple factors played a part in this decision. First of all, there is something really special about an unexpected encounter with an artwork and public art intervention toys with this exact idea. Ultimately, we intended to reach a wider, more diverse audience, placing the work in the everyday in order to spark conversation while balancing accessibility and transgression. Additionally, there is also something to be said for an embodied experience of art – that is, going on a wander to explore the works. This specifically applies to those who did not just stumble upon the exhibition but decided to seek it out, following the map provided online or going on guided tours. It was a way of engaging with the communities in Dalston and perhaps also breaking away from a high and low culture dichotomy – even just a little bit. How did your course prepare you for working on a project like this? This was the second and final live project we worked on as part of MA CCC, so naturally the first project already prepared us for what was to come, although it was on a smaller scale. This took place earlier in the year and took the form of window displays at Central Saint Martins, created by working with archival material. On the course, practical group work always moved alongside the more academic part of our studies – a simultaneity which fostered the potential for different elements of creative practice to co-inform one another. Additionally, we had a lot of workshops and feedback sessions to genuinely spend time with the idea, the concept, the realisation and the evaluation of Hair Matters. There really has been a lot of support. How have you found curating in a group of six? I had worked with almost all of the group members before in some capacity throughout the course, so I think we make a great team. It is all about trusting each other and finding a balance between learning experiences and expertise. Even with roles assigned, some fluidity will always remain; in high-pressure situations, it’s an all-hands-on-deck mentality that gets the job done, because you simply can’t do it alone. At the same time, it is amazing what you can accomplish once you collaborate, ask for and offer help. It’s been a pleasure working alongside such incredibly talented and dedicated women. What role has writing played in this project? This is an interesting question since I don’t think writing is the first thing that one would necessarily associate with the format of art interventions. Still, it underpins a project like this – in the forms of theoretical research and building a narrative framework, as well as finding the right words to represent the project and those involved publicly and privately. In that sense, if I were to expand “writing” to “words” I would say words have played an invaluable role. In activism, words are so important, not just the written word, but the ways in which we speak to, speak about and let speak. Now that the course is coming to a close, I hope to continue with project-based work, further collaborations with vFd and the locations around Dalston, as well as the people on my course. This is a great network to have by my side. The lead up to Christmas is an interesting time of the year where a lot of plans are up in the air and the groundwork is starting to manifest for the upcoming year. Ideas are starting to form, waiting to be solidified very soon. The biggest challenge I am facing is trying to unite – to some extent – my practice as a writer, curator and musician. I’m curious to find out where that combination will take me. Hair Matters was curated by Indira Béraud, Avril Bown, Mia Cormack, Rosa Droogers, Rhiannon Edwards and Bea Redweik. MA Culture, Criticism and Curation Final Projects series.